A lot of people are skeptical when they hear that you can use sound therapy to make your body heal itself from a wide variety of illnesses and injuries. They’re skeptical when they hear that you can, using nothing but sound, make profound changes in how you look and think and feel. That skepticism is understandable. We were skeptical when we were first tried it too. But then it worked…and then it worked again. And after seeing it work over and over again in our lives and in the lives of those we love, our skepticism has been replaced by belief and a strong desire to get this into the hands of as many people as possible. This sound therapy can change your life. This sound therapy can change our world. It’s been about 3 horrible months since “the noises”, a high pitched hissing sound something like static, first started inside my head. Being an MD physician myself used to being in control of treating medical conditions, it was disconcerting, initially frightening and even depressing to say the least. At times it made it more difficult for me to work, to sleep or just relax, since the sounds were loud and constant, 24/7 although somewhat better in the shower. I went to my ENT doc and audiologist, had all kinds of tests and scans, took steroids, and was finally told that I had tinnitus like 30 – 40 million other people and to ”just learn to live with it for the rest of my life”. Loud noises started to hurt my ears and I couldn’t go out to certain places because of it – my world was beginning to shrink, and I deeply resented it. Then my wife and I quickly went on a search to read all the books and articles we could find on the topic from med research and fellow sufferers to empower me with an abundance of knowledge but not with reduced noise. I bought and downloaded from the net a variety of masking sounds (waterfalls, surf waves, pink-white-brown noise, rainforests, etc), and used sound boxes, and air purifiers to try to get some sense of temporary relief. Then I embarked on a compulsive journey to take over 40 herbs / vitamin pills everyday in 3 divided daily doses, which I still continue to take. But the noise continued pretty much as before. 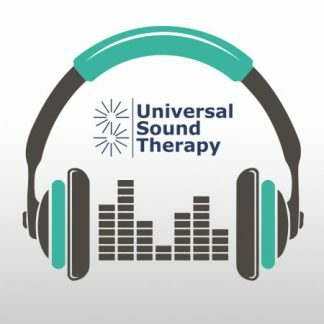 And finally, I came across this retraining CD from Universal Sound Therapy and with some initial skepticism, I decided to try it every day. Now only 4 weeks later, my noises are almost completely gone most all of the time. Whether it’s the accumulation of all the pills and this CD together or just the CD alone, I’ll never know for sure. BUT I do know this, very soon after I started to listen to the CD after 2 months on over 40 pills/day, the sounds did lessen dramatically and kept getting quieter until they finally stopped by just the 4th day of CD retaining!! From that day on I have had almost no noises at all for each of the last 30 out of the last 37 days!! And on the remaining 7 days with noise, the noise levels have been much lower and intermittent and much more tolerable. Almost total quiet for the last 37 days has been really blissful. The treatment seems to keep getting stronger, even when I skip treatment days, so I am now confident that the noises will completely abate soon. I don’t know if the sounds will eventually ever come back or not, but at least I have the security of having the tools to get rid of them if they do return. I think it would be sad and unfortunate for all tinnitus sufferers to overlook at least trying this invaluable and risk free CD. Thankfully for me, unconventional techniques such as this are available to all. I hope many other tinnitus sufferers also get the same benefit that I’ve gotten. Perhaps the most gratifying aspect of this journey for me is the feeling of sheer empowerment to be able to change, decrease, and even eliminate a condition that is considered by most professionals to be chronic and lifelong. To the producers of this technique and CD, I say simply, thank you. You have helped me immensely and for that I am very, very grateful. I have since purchased 2 other CDs from UST for unrelated problems for other members of my family. If they work half as well as this CD has worked for me, I will be very satisfied indeed. It took awhile to work but after about 3 months of doing the therapy religiously and another few months of not so religiously, the tendinitis is gone. The only complaint is that the email download was impossible to put on my I-pad and my wife had to use the CD to get it on there. I have now ordered other protocols and as soon as my wife can get them onto her and my I-pads via the CD’s, we will look forward to a more pain free life. (Note from UST:) If you do have problems downloading the protocols, let us know and we will immediately send out a new protocol using a different format which should fix the issue. I have had tinnitus since I was in my teens. It slowly got worse over the years and went to about an 8 out of 10 when I reached 60. I had a constant ringing. I tried every pill there is and none helped at all. I also saw a specialist and nothing could be done. This CD has taken it from an 8 to about a 2 in one month of daily sessions. I can't express my appreciation and relief in words. I am extremely grateful for this solution to my tinnitus and I am looking forward to trying the other CDs that are offered here. THANK YOU!!! I have had a snoring problem my whole life. It seems the older I got the louder the snoring became. Then the waking up periodically throughout the night started. I was always exhausted in the morning. Friends suggested that awakening in the night was not uncommon, and perhaps this was all a part of growing older. I went to the doctor. After testing, I was told that I have sleep apnea and was sent home with a c-pap machine. I struggled with the machine for a year. Some nights it seemed to help but other nights I stayed awake-- acutely aware of breathing with a mask over my mouth and nose. The breathing machine was not the solution to my problem. My prayers were answered when I found Universal Sound Therapy. The very first night I used the sleep apnea frequencies I slept soundly. I listen in bed with a headset several times a week. My husband marvels that I am no longer "snoring like a truck". He says I now have faint and quiet breathing as I sleep. Best of all, I am no longer exhausted in the morning! Thank you. I appreciate you, the frequencies, and the help you have provided for me and for all people who suffer with this problem. God Bless You! I have been using the Inflammation protocol daily for just a few days which has already resulted in higher energy levels and a significant reduction in hip pain and other joint discomfort. I'm very impressed and grateful.